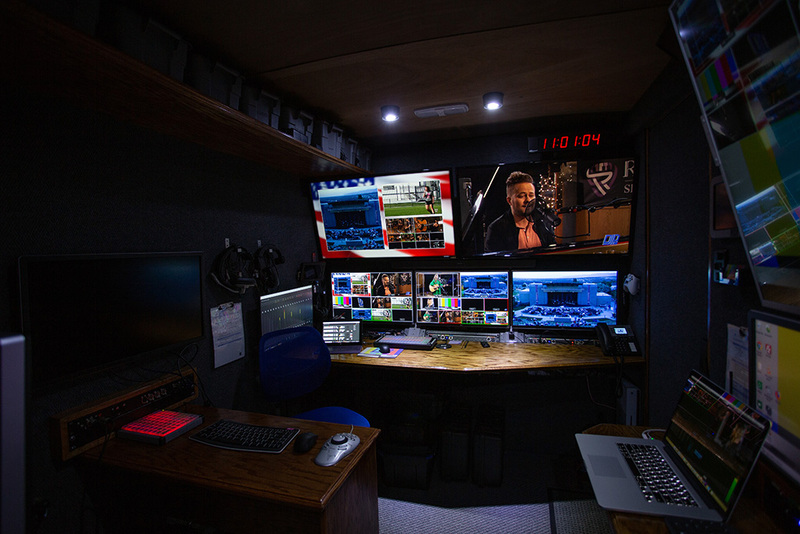 The DJP Mobile Production Unit is a 16-foot trailer that allows us to have all of our production capabilities available to us anywhere we go, and to be setup in just a few minutes. Everything inside supports Ultra HD 4K, it can seat up to 8 crew members, and it has flexible signal routing to allow most functions to be performed at any position, allowing us to optimize the layout and workflow for any event. When giving tours of the trailer, DJP posts cards at each station describing their function. These are available for download. The MPU is setup so that any video signal can be routed to any location inside the trailer, so most jobs can be accomplished from any seating position. Certain jobs are more optimally performed from specific locations, as shown below. We have a list of some of the technology features of the trailer, and a partial equipment list. Also, see the FAQ page for answers to common questions. Even though it's new, the DJP trailer has been used for more than forty days of production. We've listed a few of the publicly available videos that we've shot with it here. We have a YouTube channel where we covered the construction of the trailer. Ronald Tolley of ClearVision Reserve LLC captured a 360° view of the interior.